Since the birds’ stay in Moscow has been prolonged, Nige and Roland have been taking it in turns to oversee their care in Moscow. Nige returned to Moscow at the weekend and reports that yesterday the birds were checked over by the Moscow Zoo vet. She listened to their breathing with a stethoscope, assessed their body condition by feeling the muscle on their chest and took swabs to check for disease. 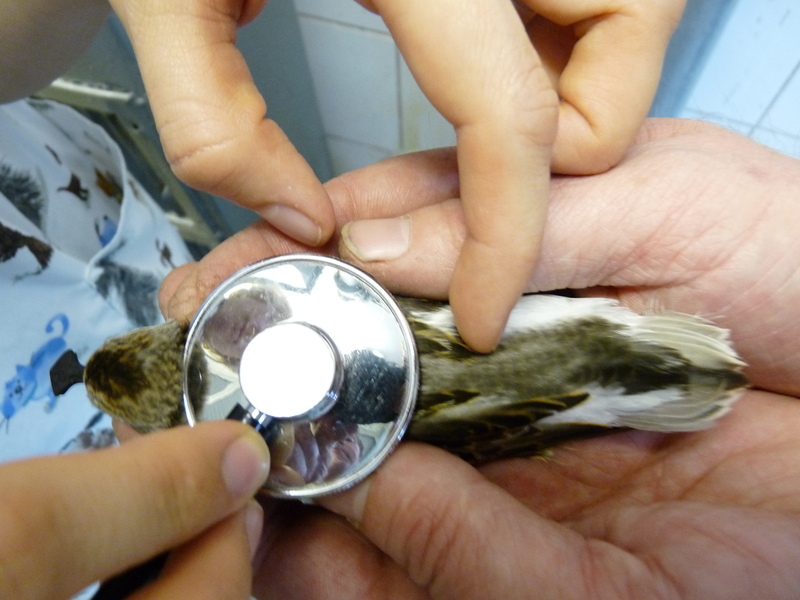 The team is doing all it can to monitor the birds’ health and eliminate any risks. The checks showed that all the birds were breathing normally and had gained weight too, which is a sure sign they are fit and well. They are all beginning to moult from their brown juvenile to silvery winter plumage. The continued good health of the birds is a testament to the excellent staff and facilities at Moscow Zoo, where the birds are quarantined. We’re very grateful that the care and support that they offer is as good and has helped us raise thirteen birds. Whilst three birds have died during the long period since their arrival in August, this is more than three times the number that we’d expect to survive this long in the wild. Sorry to hear that it’s now down to 13… but I don’t want to linger there. Importantly, it’s all still on track and the remaining birds are looking healthy. When can the birds be expected to head to the UK? Well done, guys, for getting the birds this far. well done! Now i just want to hear that they are in UK – hope they wont suffer in the cargo hold. it has been a long, frustrating time for all involved and for all those well-wishers worldwide. We can start to breathe again when they are safely installed in their new winter quarters at Slimbridge. Three cheers for Nigel & his team! 9th? Not far off. I have everything crossed! So they may well arrive during the Autumnwatch programme?? That would be even more fantastic. Thank you for all the blogs keeping us up-to-date with all the absolutely amazing work you’ve been doing with them. Well done. Hi;just wondering what other birds this species associates with as this may enhance the breeding programme. Assuming everything goes according to plan (and experience has taught us it’s dangerous to assume this! ), the birds are now due back on Thursday. We will update you all as soon as they are (hopefully) safe and well at Slimbridge. We also have some absolutely fantastic videos of the birds which we will share with you shortly. This has been a very challenging project for us, but we hope that this week will mark an important milestone in Spoon-billed Sandpiper conservation – the first step in establishing a conservation breeding programme for this incredible species. The WWT Conservation Breeding team have done a marvellous job – ably supported by our partners at Birds Russia, RSPB, BTO and the Spoon-billed Sandpiper Task Force. The term conservation heroes has been coined by some bloggers to describe the staff working on this project. Here, here! Late yesterday afternoon we found out that the birds arrival has been delayed! We hope by just 24 hours. Flights and hire cars have been re-booked for Friday. Thanks for keeping us up to date, Baz. I hope everything goes smoothly. Potentially a big day… I still have everything crossed. Good luck.